So you think you know how to pick the healthy choice for your kids - but how easy is it to pick out a healthy choice?Take our quiz to find out. Score one point for every correct answer. Picking a Healthy Drink: Which is the healthiest drink? It’s not as simple as it looks. Generally, water is the best option – it’s low fat and low calorie, and it comes out of the tap for free (bottled waters are a waste of resources and tend to be expensive). Full-fat milk is a good main drink for children between one and two because they need more calories and vitamin A, and milk is full of calcium, protein and vitamins (children between two and five can have semi-skimmed milk as a main drink, and they can move to skimmed milk from the age of five). Orange juice and smoothies are full of vitamins and contribute to five a day, but juices are still high in sugar and can contribute to tooth decay and weight gain – perhaps have a smoothie instead of a pudding, and dilute orange juice with water as a drink. 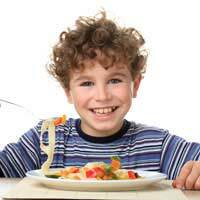 Kid’s Menus: Is the kids’ menu always a healthy choice? Though the portions on kids’ menus are usually smaller, the choices tend to be high in fat, sugar or salt. It’s better to ask for a half-size portion from the adult menu, or pick a starter. Breakfast: Which is the healthiest cereal? Shredded Wheat is high in fibre and contains no added sugar and salt. Cornflakes can be high in salt, and some types of muesli contain added sugar. Cocoa Pops are great as a treat, but are very high in sugar. Avoid cereals with trans-fats, or added salt, and have cereals with added sugar as a treat. Eggs are high in cholesterol and are bad for you? Many people used to think that eggs were unhealthy and advised no more than three eggs a week. Eggs are high in cholesterol, but according to studies, the cholesterol in eggs does not affect the levels of blood cholesterol, and it is more important to avoid saturated fat. Eggs are low in calories and high in protein, vitamin A, vitamin B2, vitamin D and iodine. Having an egg for breakfast can lower the number of calories eaten during the rest of the day, so help with weight maintenance or weight loss. Puddings:Do you always say no to puddings or sweets? So what do your quiz scores tell you? 2-3 Getting there, but there are a few things that you could still change. 4-5 Wow – you are the healthy eating champion! Keep eating well.